Justine Skye ft Arin Ray (Build). 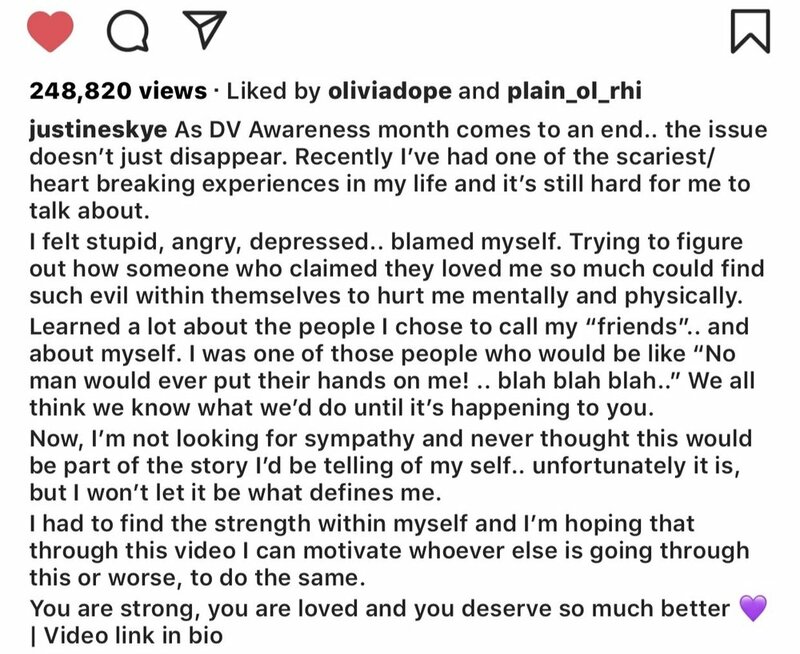 On Instagram Justine talks about her experience with domestic violence. On October 5th, 2018 Justine Skye released her single Build ft Arin Ray. The song talks about the constant need of building a man up a flaw that many women have. Which can lead to many arguments and can sadly lead into domestic violence. When the song was first released I knew it had a deep message but later on Justine Skye shared she is a victim of domestic violence. October 23th, 2018 we also learn October is Domestic Violence month. Justine shares clips of her new single “Build” showing the vulnerability and sadness many women feel during domestic violence experiences. She opens up to her fans and the world and shares “Recently I’ve had one of the scariest/heartbreaking experiences in my life and it’s still hard for me to talk about. I felt stupid, angry, depressed… blamed myself”. She later explains with her experience and being vulnerable and open about the situation she hopes she can help the next person who is dealing or currently in the same position. A native of Brooklyn I’ve followed Justine Skye since Tumblr. It is great to see her evolution and to witness her music get better and better every time. She is also a inspiration to many people because she is dark skin and slim and girls with similar features aren’t praised at all. Wishing her the best on her career as a singer and model.